My flip flopped feet sunk into the mud. I should have known better, better than to sign up for a swampy mangrove excursion with only flip-flops as footwear, but I didn't. Ohm, attached to my back in his Ergo carrier, kneed my ribs like an experienced horseman. Steadying myself, I grabbed a vine from a tree to my left. "Step on the log." Winston, our guide called. Griping the vine, I hoisted my weight onto a sunken log, the only steady ground in a sea of mud. Praying Ohm would settle and stop shifting about, I took short quick steps. Mud caked around my feet and ankles. Having learned about the delicate red mangroves, natural purifiers of water and about their heartier cousins the black and white mangroves and having encountered various medicinal herbs and plants, we were making our way through the mangrove swamp to the crocodile nursery to encounter Jamaica's endangered crocodiles. 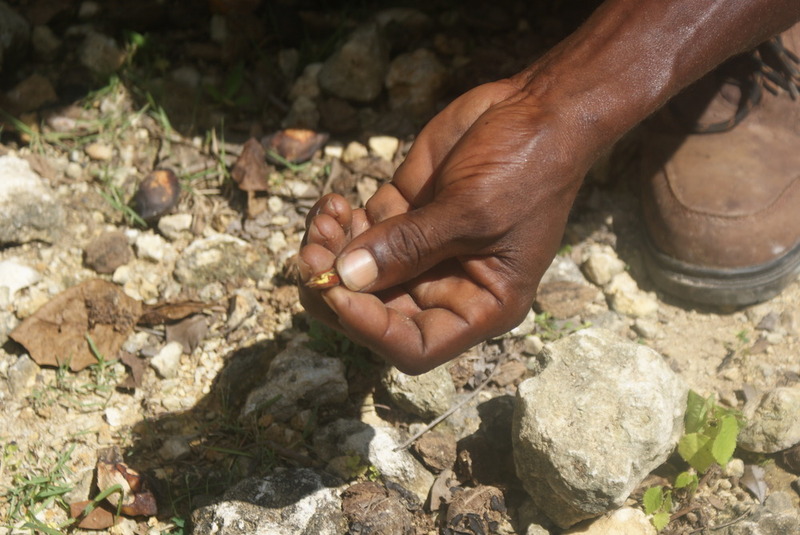 Pausing for a moment to catch our breath in a clearing dotted with almond trees, Winston cracked a few casings with a rock providing us a hearty and intimate sample. The almonds were small and sweet. "Yeah man. We eat almonds everyday. They good for everything, heart, skin..."
Before the almonds it was basil, before the basil it was ackee, before the ackee it was mint. We had run into a little bit of everything. After a short adventure onto a rickety narrow wooden dock that was missing just about every other plank, we came to a wooden platform surrounded by a fence. White herons circled the trees that grew from the brown placid water. Opening a cooler, Winston produced raw chicken parts. "John!" 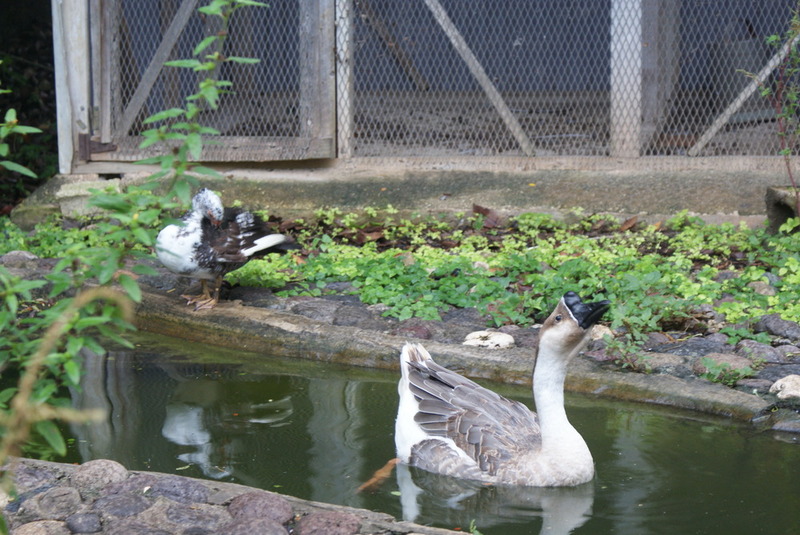 he began to holler, hurling a chicken breast into the water. "Come here John. Dinner time." "They answer to names- the crocodiles?" I was confused. "Oh yes. John I call first because he's small and lives over there to the left beyond those trees. He gets intimidated by Herold and Daniel, so I let him eat first. He usually pops up right here." Winston pointed to a spot in front of Mark. "You may want to stand back. Sometimes he shoots right out of the water. You know crocodiles can stand on their tales and jump six feet into the air." "How high is this fence?" I felt a sudden sense of urgency. Mark and I both took a few steps back. "John! John!!!! Hey John!! Come here!!!" Slowly the water near the trees to our left began to ripple. John's tawny head appeared. Slowly, steadily, he made his way towards us stopping along the way to grab pieces of chicken. "Hey! John man!" Winston called out. John stopped before the platform and turned to acknowledge Winston. He turned again to size Mark up. "Fish!" Ohm called with a shriek. "No, that's a crocodile." I corrected taking another step back. Unimpressed, John sunk beneath the water apparently having other more pressing plans to attend to. "He's my favorite, John. I come out here and have lunch with him every Tuesday and Friday. We have a good ole' time." Winston chuckled as he said time, as if human crocodile lunch dates were commonplace. Then it was back to business. "Herald! Daniel!" Winston began to hurl whole chickens into the water. "These are the big guys. More than nine feet." "Nine feet? How big was John?" I couldn't wrap my head around the sizing. John to me looked enormous, I couldn't conceptualize John being a "little guy". "Nah. John a small ting. Almost six feet, not full sized. Herald and Daniel, now they're the big bosses." Winston released another one of his hearty chuckles as I took yet another step backwards. "Daniel! Herald! Come now, dinner!" Winston hurled one lifeless pallid chicken carcass after another into the water. I was beginning to feel nauseous. "You know, crocs, they do what they wanna do. I don't think they're coming out. It's a shame. You should see them." Mark and I both agreed that it was indeed okay. We could imagine their grandeur. 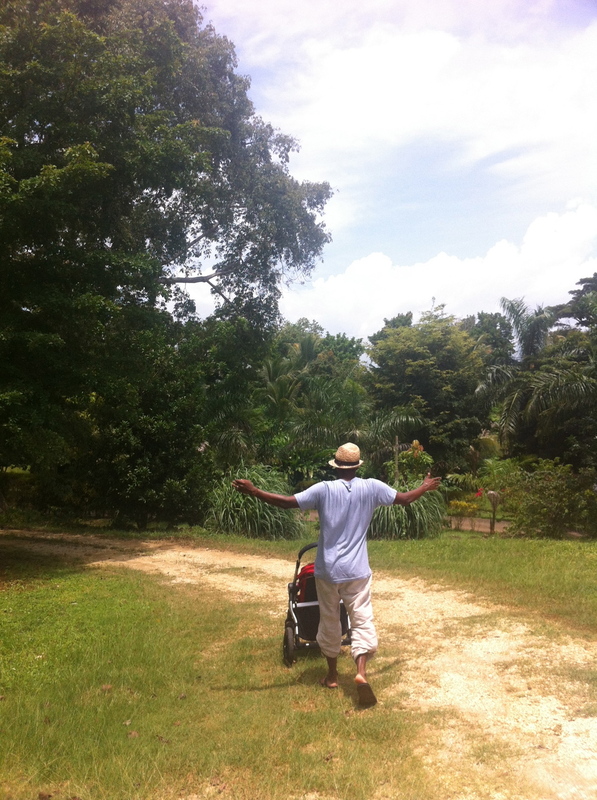 We began the thirty minute trek home; over the dock, through the swamp, past the almond trees, into the mangroves, past the ackee trees and nooni fruit, the basil and the mint, through a horse stable at the base of the mountain and into the familiar. The Mangrove and Crocodile Excursion at the Rhodes Resort is so much more than an up-close peek at some of natures most feared beasts, it's a chance to experience and understand the abundant natural beauty of Jamaica. 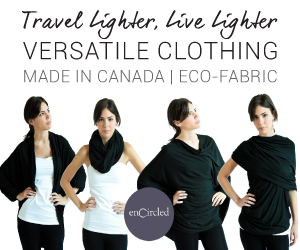 Within the span of the tour, you encounter so many diverse ecosystems and micro-climates. It is truly a unique site to behold. 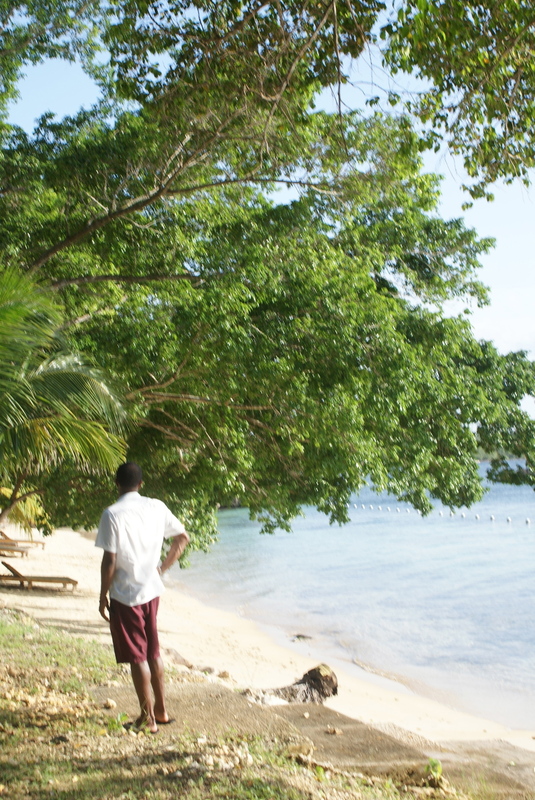 We had the pleasure of staying at the Rhodes Resort during our stay in Jamaica last month. 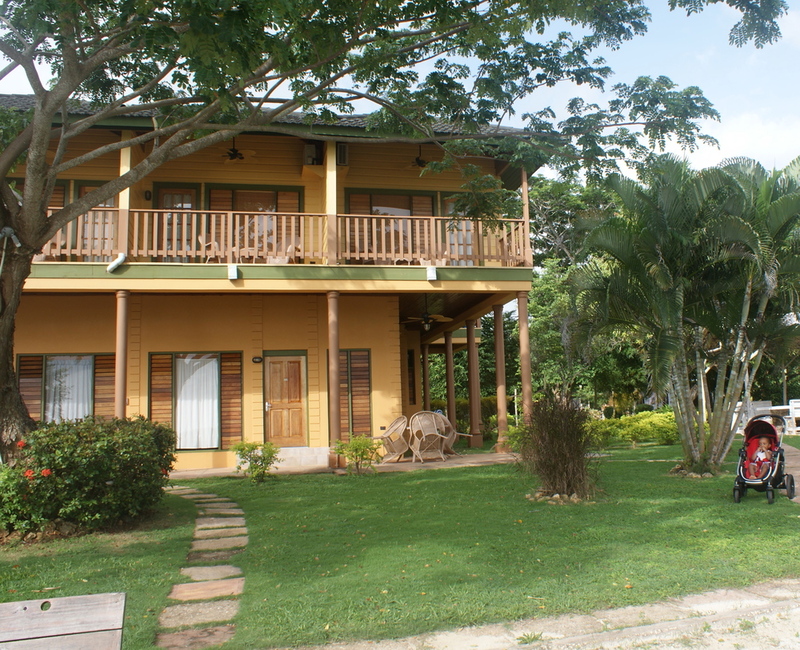 Located on the historic Rhodes Hall Plantation, the Rhodes Resort was a low key natural oasis of calm. This is the perfect resort for nature lovers and interactive travelers. Free of frills and touristy tack, Rhodes Hall is a place of respite, reflection and connection. The Rhodes Resort has 27 all inclusive and room only, suites, villas and family cottages. 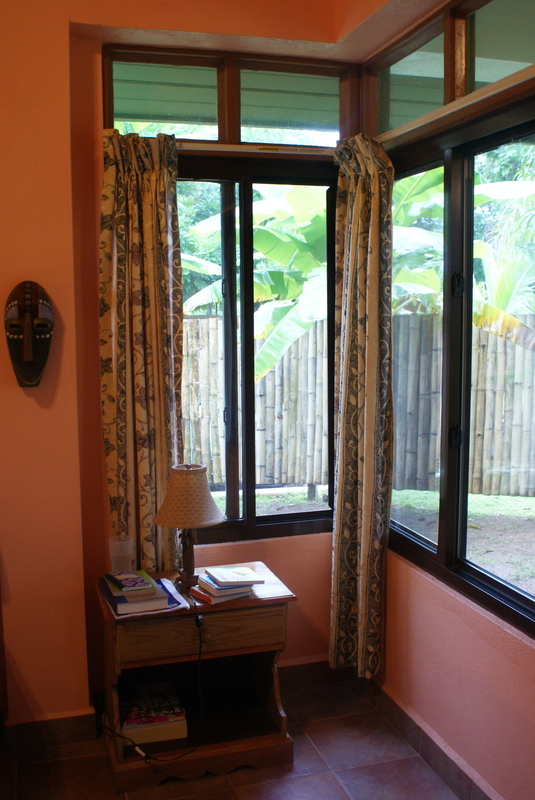 Rooms and verandas are fully furnished with a local flair and come with a variety of amenities. 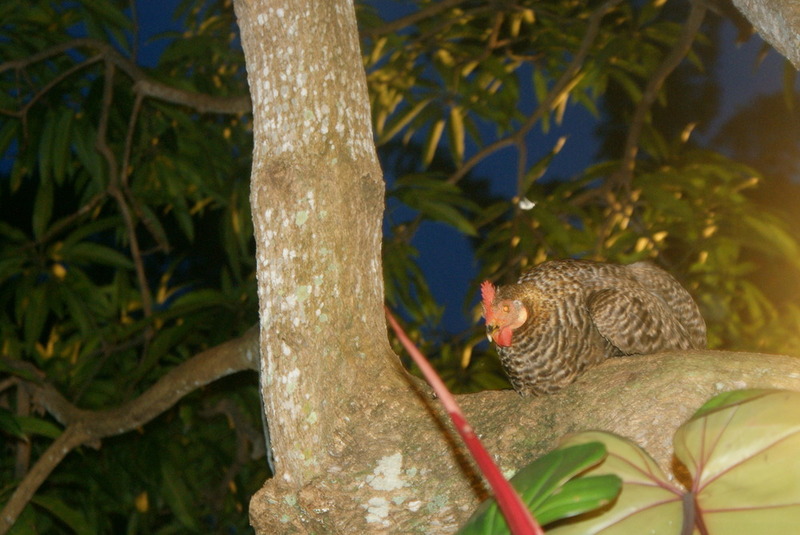 We spent a lot of time hanging out with the peacocks that made a home in the mango tree at the corner of our veranda. 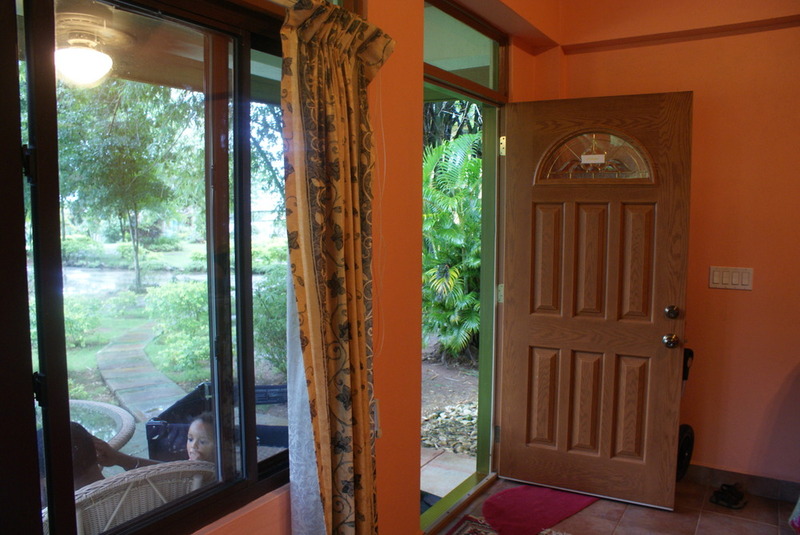 Maid service is available daily and towels and basic toiletries are provided. The food at the Rhodes Resort is mainly provided by the Bay View Restaurant which is located on the resort. Along with phenomenal views of the Caribbean Sea, I appreciated the fact that I was served traditional Jamaican dishes and not Western inspired meals. You can order off the menu at the Bay View Restaurant or you can purchase a meal plan which covers three meals a day for a set fee. The meal plan is the way to go if you plan to spend the majority of your time on the resort as there are few other options due to its secluded nature. 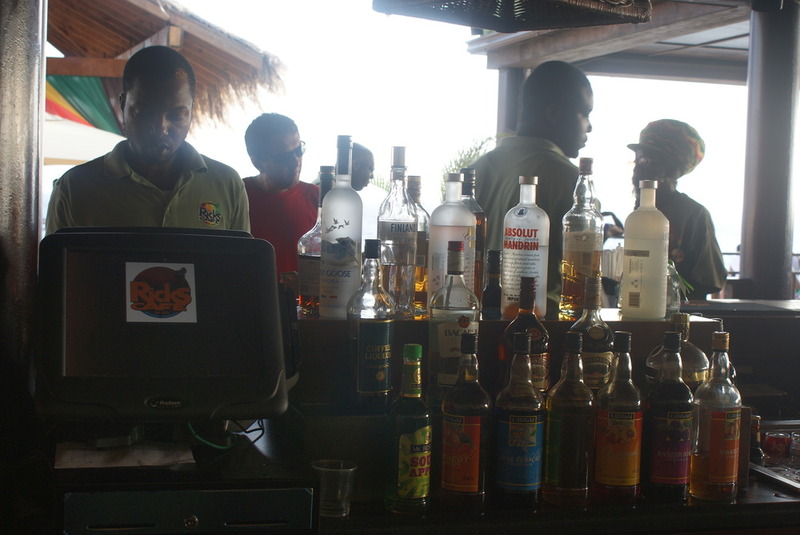 Other dining options on the resort grounds include the Jerk Grill (seasonal) and the Plantation Bar. A stay at the Rhodes Resort on the Rhodes Hall Plantation is a unique experience. 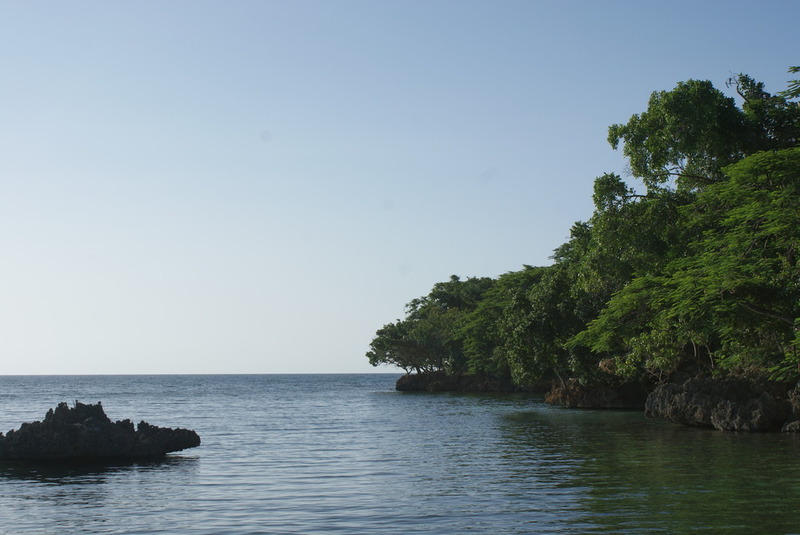 It is a chance to intimately experience the raw and natural beauty of Jamaica and connect with the simple pleasures of life. I'd like to thank the Rhodes Resort for a wonderful stay. We will be back! 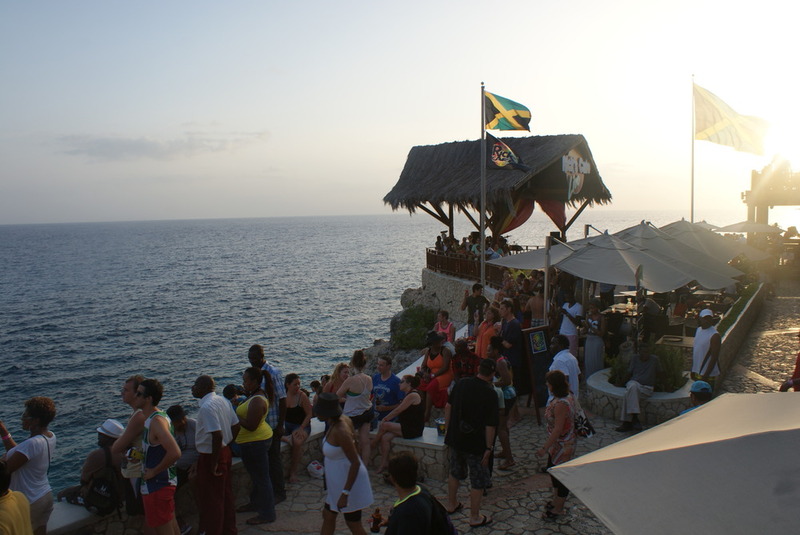 The One Love Juice Cafe of Negril, Jamaica- A Juicy Gem! We moved gingerly and in a straight line down the dusty dirt road. Cars and bikes whizzed by blowing hot smoke at our calves. The sun pulsed down upon us like a stage spotlight, highlighting our every move as we were hassled mercilessly by men on the street. A man in a red shirt was waving to us from the side of the road. I could barely make out a sign that read fresh juice. We hesitated, then continued walking. "Come on over. I've got cold juice." He beckoned once more. 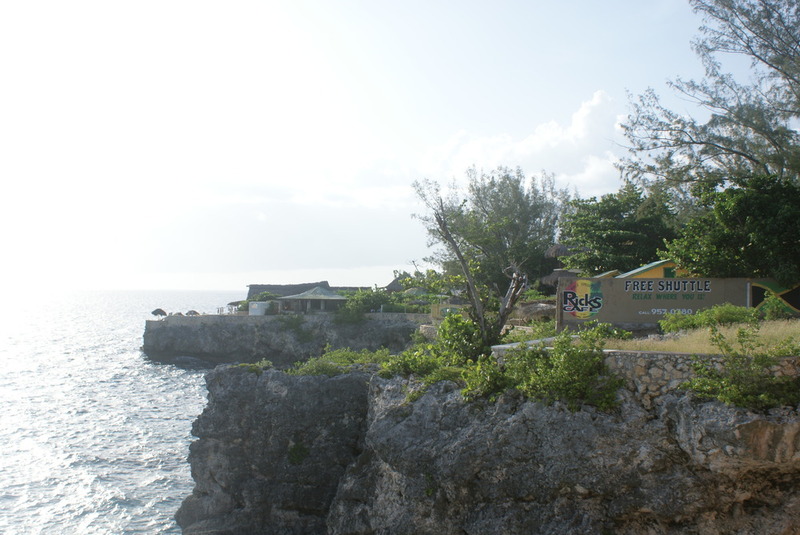 This time we stopped and made our way over to discover a beautiful gem in Negril. Before I arrived, I envisioned myself sipping freshly blended juice, drinking raw coconut water and eating ital food by the beach. I pictured rastas with shining skin and gorgeous locks. I heard the songs of Bob Marley and knew I would have a soul stirring great time. Just as we had given up all hope of making any meaningful connections and having any positive exchanges, we found the One Love Juice Cafe, or rather, it found us. Towards the little stall and the man in the red shirt we crept. I ordered a simple carrot and cucumber juice with raw sugar cane. 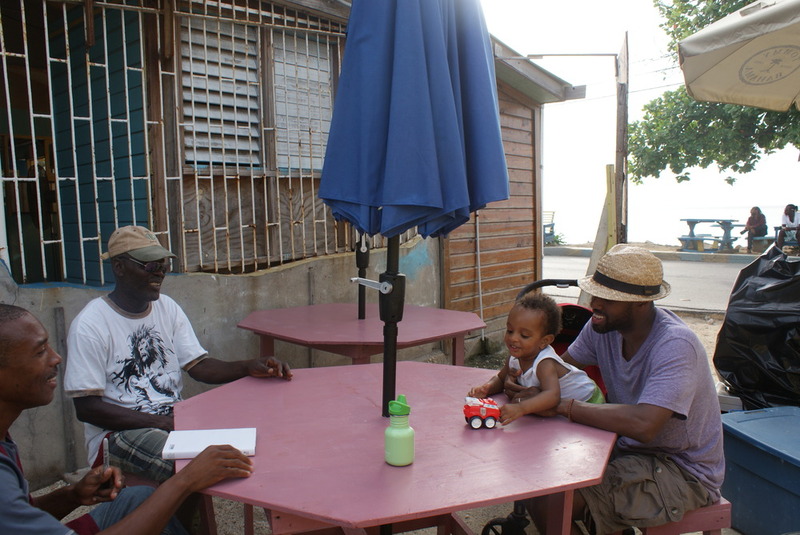 The owner, an easygoing man named Michael sat down with us, as did two of his friends. It would be another three hours before we got up. 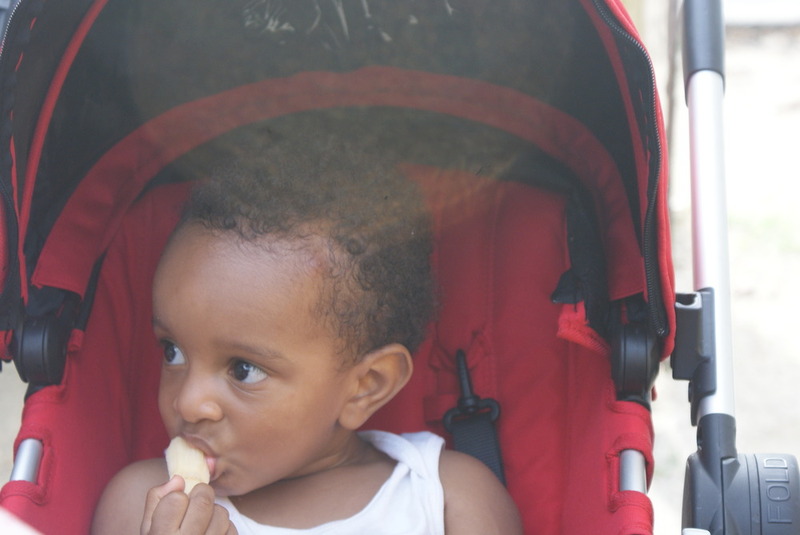 Michael, born and raised in England, lived in New York for twenty years, and had just moved back to his native Jamaica to open his juice bar, the only juice bar as it would turn out in Negril. 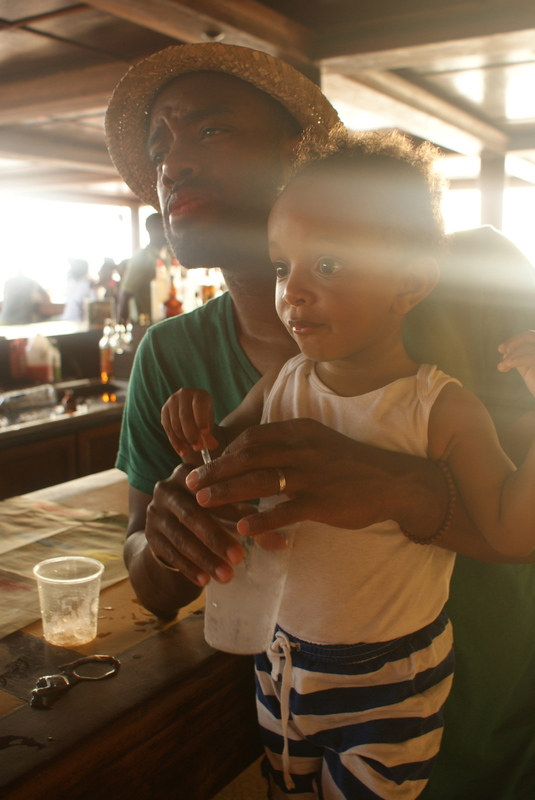 It was his first week in business and his goal was a mighty one- to bring health and vitality back to Negril. Talking to Michael and his friends, we learned about the medicinal properties of sugar cane, a powerful source of natural chlorophyl. We talked sea moss and meditation. We talked about the diabetes and cancer epidemics that are currently plaguing Jamaica. We talked about the poverty, crime and helplessness. I got a backstage tour of Michael's juice factory. It was inspiring to see how driven and passionate he was about wellness and healing. He distilled his own water. Had elaborate juicers and extractors. Michael was a man with a mission. 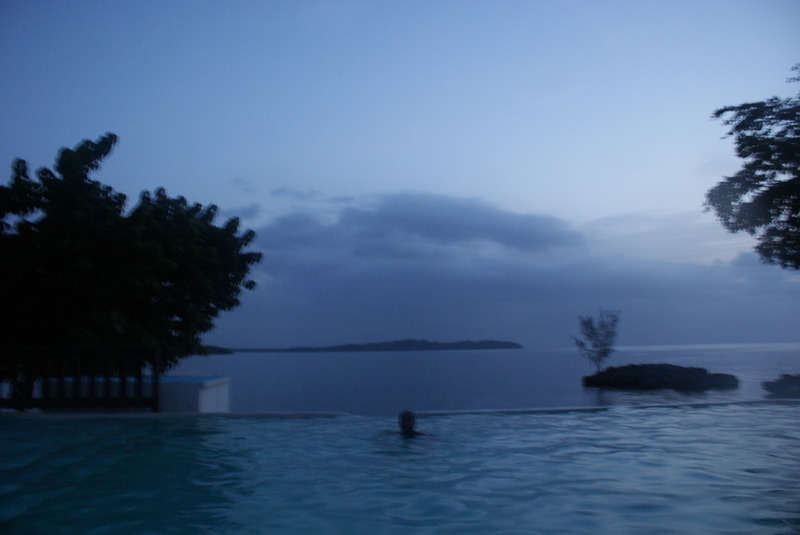 We left for our modest eco-resort on Green Island after the sun set. We left with new friends and new understandings. I finally got my fresh juice. If you find yourself in Negril, you must make your way to see Michael at the One Love Juice Cafe next to the Corner Bar in Negril's West End. It is well worth the trek. If you are on your way to Rick's Cafe or the Lighthouse you'll pass it on the way. "Hey mon, what you say you buy me a bit to eat? Let me have one of those patties from that shop there." "No." Mark replied evenly as we attempted to navigate the broken sidewalk with our enormous red stroller. The man filled the tight space between us. His feet were swollen and his heels bled. "You're going to stop here and buy me something to eat!" "NO!" My voice startled even me. I could feel the heat invade my face. My eyes became slits. The man's yellow eyes left Mark and met mine. Mark's eyes also met mine, his eyebrows furrowed in confusion. The man sucked his teeth and backed down. We hesitated for a brief moment before taking off. Ten seconds later we are aggressively approached by another beggar, and then another, and another. When we ventured off our laid-back eco-resort on Green Island to see what Negril had to offer, we weren't ready for what we would find. The cab driver dropped us in the middle of a busy bus terminal, then barreled down the road before giving us change. To the right and to the left, Negril, weary and beaten stretched before us. 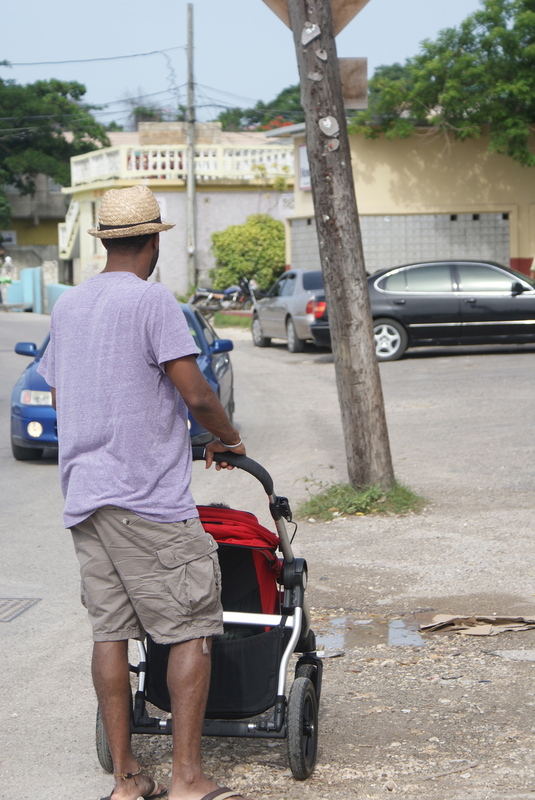 One thin windy road at times unpaved, few sidewalks- Negril. Cars, vans, buses, barreled at top speed around sharp turns, vomiting exhaust fumes, rattling buildings, scattering debris. We walked beneath the glare of the sun for forty minutes. Every few steps we were approached, had something shoved in our faces, were told what we were going to do with our money (not asked). There are few places in this world that I don't like, Negril is one of them. If you visit Negril and you don't know a local who can personally show you around take a taxi directly to your intended destination. You don't want to make our mistake of saying "Oh just drop us off in the center of town so we can explore..."- big no no! Don't walk around with anything valuable and keep your eyes open (especially when crossing the street!). 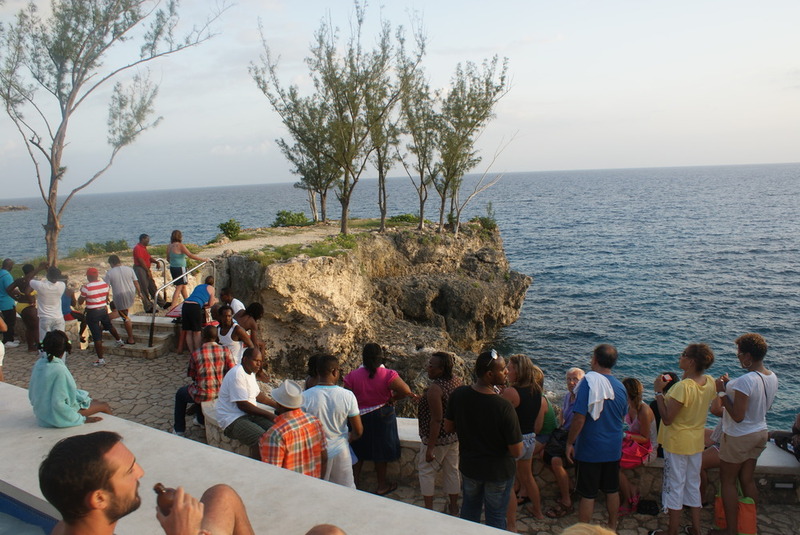 There are two main tourist attractions in Negril: Ricks Cafe and the Negril Lighthouse. 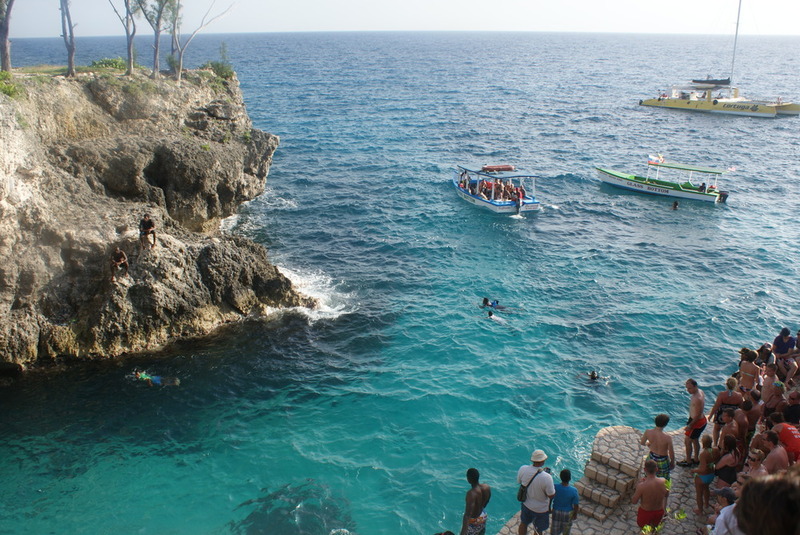 Have you been to Negril? What was your experience? 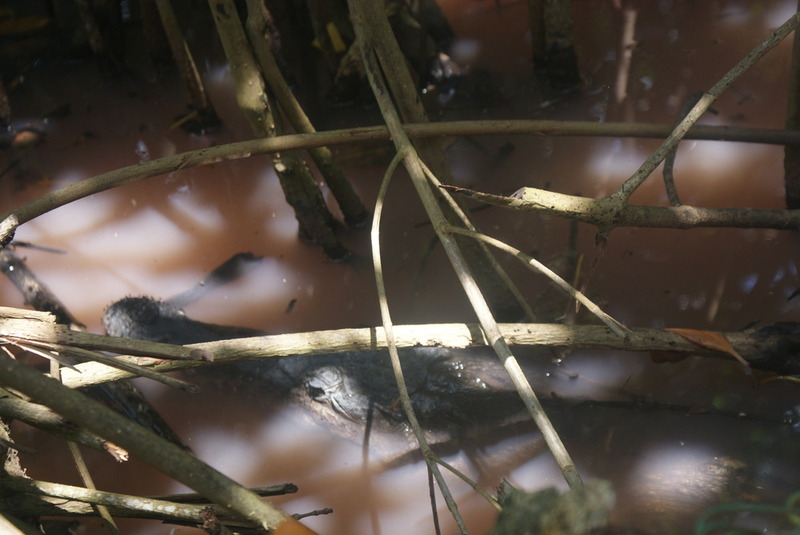 Anxiety Inducing Tale #1-Setting: At the Crocodile Reserve on Green Island near Negril, Jamaica as my husband and I leaned over a four foot wire fence in an attempt to get a better look at the six foot crocodiles that stalked below us in the murky water. "Yeah mon. These are just the babies you know, the little guys. Out there in the mangroves are the big guys, twelve feet they are. You wouldn't believe it. They don't usually show themselves when the little ones are around. They like to surprise people and pop out of the water. You know those guys can stand on their tales and jump nine feet in the air. That's how they hunt sometimes. You can't see them on the surface, they just jump out of the water and - POW!" Setting: A nature walk also on Green Island as my husband and I navigated a swampy dense mangrove in flip flops, clinging to and ducking beneath vines like Tarzan in order to not end up face first in shallow murky water. Did I mention I was simultaneously totting my almost two year old on my back in an Ergo carrier (24 1/2 lbs of wiggles). "Mon, I'm always glad when a woman is around. You know what they say, snakes don't attack when a woman is around. It's true, they say that. Wow, you should see the snakes in these mangroves, especially in the mountains. Sometimes you don't even see them until they start swinging back and forth, holding onto a tree limb with the tip of their tale. Ha- it's wild. Once they start swinging, they're ready to swoop in for a bite- POW! You don't even see em' cause they blend in with the branches. See this bite here on my arm, a snake took a big piece out mon. He started swinging and he got me right here- POW! Yeah mon, I remember this time the mother of my baby was pregnant, I was working up in those hills and she came out with me one night. When morning come, I woke and there were snakes all over her. One on each arm and leg, a bunch of em' curled up under her dress. They come in for human body heat at night, but you got to be careful when you wake cause you can't startle a sleeping snake, oh no. I had to tape her mouth while she was sleeping, then take a stick and carefully lift her dress and remove each one gently so they wouldn't wake. That a mean bite mon." What tales have you heard while traveling? 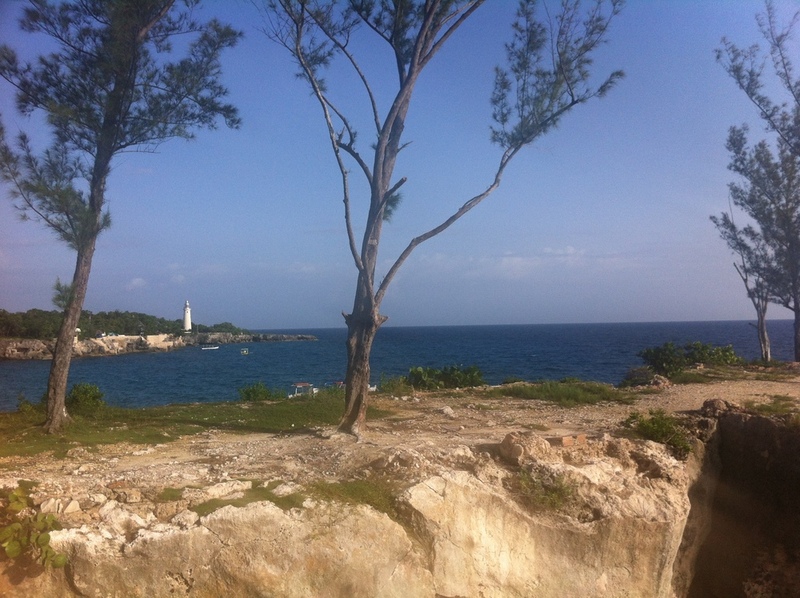 A Cyclone and an Intervention in Jamaica! We flew to Montego Bay, Jamaica with a hurricane on our trail. All I knew was that I wanted to get there. I didn’t think much about anything else. I was a woman with a plan and a new country to explore. We landed beneath a dry sky; the late afternoon sun was brilliant. Nestled inside our secluded eco resort on Green Island, we grabbed a coconut curry dinner and enjoyed the saltwater infinity pool just feet from our cottage as the late afternoon gave way to evening and eventually night. 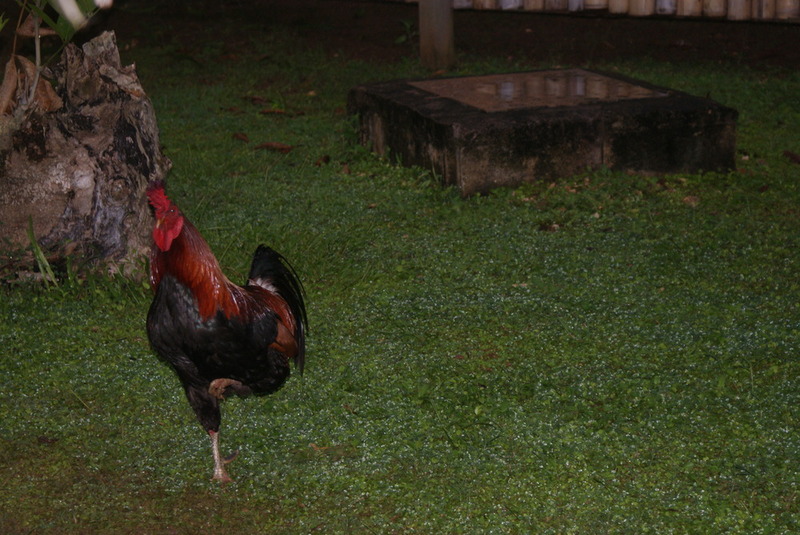 The next morning, the sound of roosters and peacocks called us to action. The sun illuminated the sky. Piercing white rays filtered through our window marking the beginning of a promising new day. After a hearty breakfast of salt fish, callalou and dumplings, it happened. Sunny skies rolled out in place of gray ominous ones. The lapping of the ocean intensified.There was the unmistakable growl of thunder and the clanking of bamboo reeds as they slapped against each other in the wind. Raindrops as thick as my fist burst like water balloons on the rocky road. The lightning joined in and we had ourselves a full-fledged and uninhibited cyclone, the result of the passing hurricane off the coast. I came to Jamaica with a plan and a promise. I planned to finish Americanah, the novel by Chimamanda Ngozi Adichie that I’ve nursed slowly during subway trips. I planned to read Sahara Special (summer reading for work) by Esme Raji Codell. I planned to blog for several hours every morning. I planned to continue working on my social media campaigns. I made a promise to myself when I joined the National Blogging Month challenge that I’d blog daily for the month of July. I had posts planned and prepped. The plan was to rise at 5:30 am, work until 9 on the blog and social media before Ohm and Mark began to stir in competition for my attention. I made a promise to my readers, a readership that has been growing and expanding by the hundreds. I do not take lightly the fact that people have voluntarily signed up to explore the world with me. 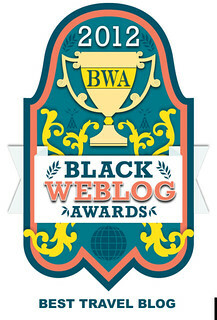 It is humbling and inspiring and I am so grateful. In turn I feel an enormous sense of duty to be present, to show up, to put forth my best. I came to Jamaica with a plan and promises. 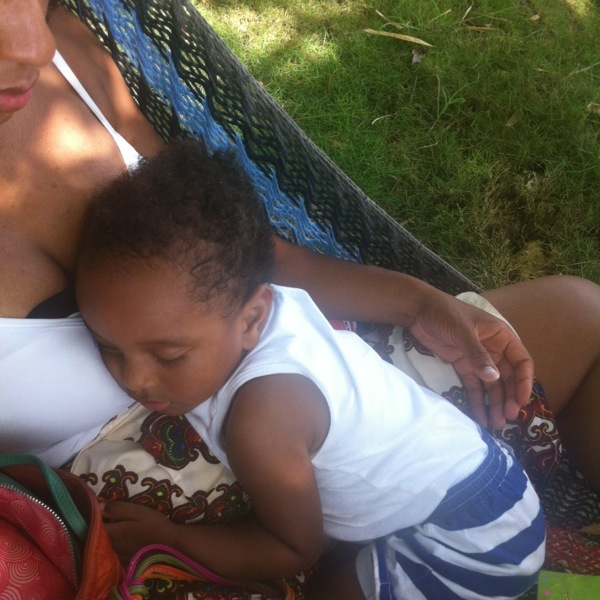 I came to Jamaica and got a reality check! Beyond my control was the cyclone that knocked out the rickety rural Internet and later the power. Busy tracking entrants for my latest giveaway, I needed the Internet. I had writing to do. There were photos to label, size and organize, and social media campaigns to manage. In short, I was helplessly disconnected. That’s the catch with travel blogging daily. Even though you’re away, you’re still connected to your creation, tied to the act of chronicling. When you’re not writing, you’re editing, when you’re not editing you’re posting and sharing via social media, organizing photos, it’s the promise you’ve made to yourself, it’s the promise you’ve made to your followers. That’s when my husband Mark stepped in with a mini-intervention, the one where he pointed out ever so calmly that it was I who was the “crazy” one, attempting to organize a ride into town during a cyclone- what?!? A rum and coke was placed in my hand, a massage was given and I was ushered onto the veranda to the right of the wide umbrella like leaves of the banana tree, directly behind the sinewy mango tree, where I learned that sometimes you have to just let go and give in to the moment- after all, isn’t that the point of travel in the first place? It’s easy to do this when things are going well. It’s easy to do this while swaying in a hammock beneath two palm trees or back floating in the salty ocean, but when things become interesting and go awry as they often do while traveling, it isn’t always so easy to let go and just be. Summoning my inner Buddha, I released my expectations (at least I really really tried to and succeeded at intervals in achieving a blank slate-ish existence). About an hour ago, I took Ohm for a barefoot walk in the rain until the lightning sent us scurrying back to our cottage for shelter. 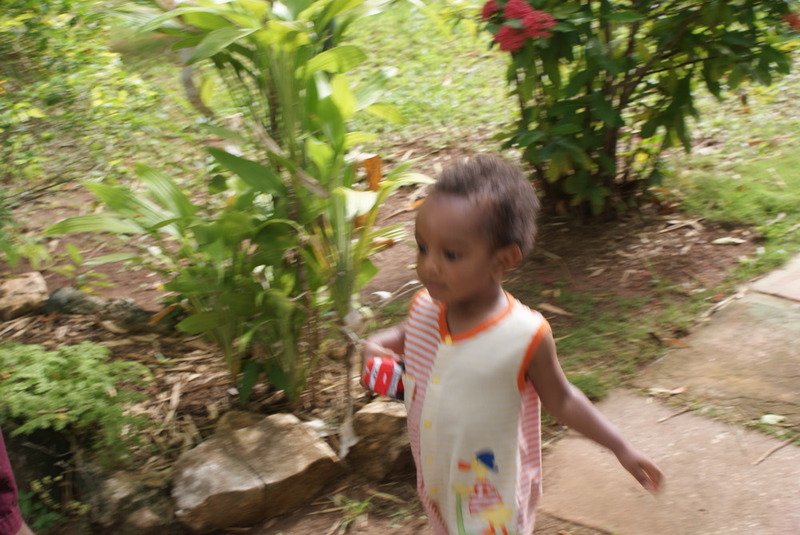 Our day, easy, has been spent snacking on bananas and almonds, watching movies on our laptops, and being entertained by the interesting and complicated relations between the chickens and peacocks who stare down at us from the mango tree as mongoose play tag at its base. Irie man, Irie. Everyting is Irie!